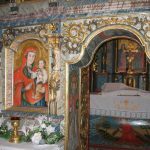 The most numerous group of wooden churches in Slovakia is that formed by the Greek Catholic and Orthodox churches, which are scattered all over the north eastern region. The most characteristic feature of these religious buildings is their emphasis on the number three, symbolising the Holy Trinity. This can be seen not only in their three domes, but also in their groundplan, with three areas arranged in an axis ascending in height from west to east. The women congregated in the babinec (babinets), the area nearest to the door and the men in the nave (the largest part of the church), while the sanctuary was used for church rites. A wooden screen known as the iconostasis, typically incorporating three openings or doors and painted with icons depicting Christ, the Mother of God, the saints, feast days and the prophets and apostles, separates the nave from the sanctuary. The Greek Catholic Church of St Nicholas at Bodružal dates from 1658 and is of log construction with three parts. Three towers rise from its shingle roof. The church compound is surrounded by a log fence with shingle tops. 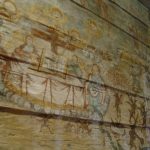 Remains of wall paintings from the 18th century survive in its interior. The iconostasis and several icons other icons date from the late 18th century. The church was completely reconstructed in 2004. 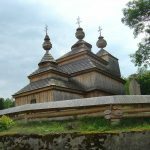 The church at Bodružal, along with seven other wooden churches of the Slovak part of Carpathian Mountain Area, has been included on UNESCO’s Word Heritage List.